“The Loneliness of the Long Distance Runner” is a short story by Alan Sillitoe, later made into a movie. The title has often intrigued me. It conjures up pictures of a solo runner, running on empty streets, a sad look on his or her face. Since I became a long distance runner, loneliness is about the last emotion I have experienced. And nowhere was this more apparent than at the Marine Corps Marathon. The entire weekend I was surrounded by friends from all over the country, supported by 10,000 Marines and countless volunteers, and inspired by amazing runners and soldiers, sailors, and airmen. I arrived the day before the marathon. 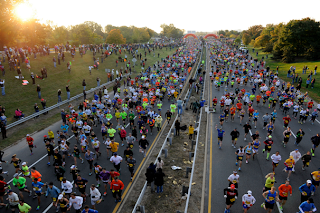 Washington DC was ready for 30,000 runners from all 50 states, the District of Columbia, and more than 50 countries. Our timing was perfect. Only about a week prior to the marathon has the government gone back to work after a 2 week shutdown. 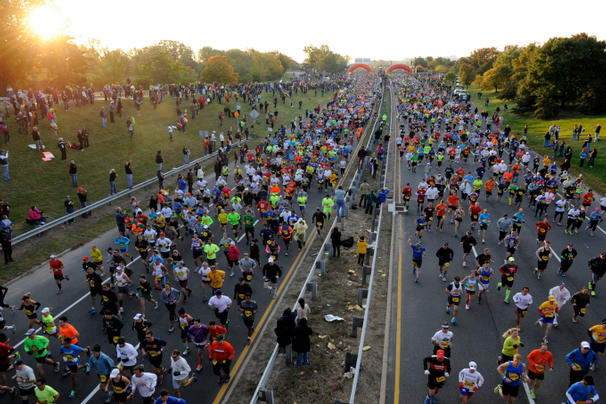 Had this not occurred, the marathon, run on 60% federal property and supported by thousands of government workers, would most likely have been cancelled, as a couple of marathons in NJ and Virginia the weekend before had been. Several of the Brevard County, Florida runners from Doug Butler's running camp met up at the expo for bib pick up and the purchase of many Marine Corps Marathon T shirts and running attire. life from the early 1970’s to the 21st century. Marathon morning brought us perfect weather - clear, no rain, temperatures in the 40's to start, in the 50's throughout the race. Just after sunrise, my friend Sue and I made our way to the start mat. Sue is a Navy lawyer from St. Louis. She is a former Indiana University runner who has qualified for the Boston Marathon more times than I can count. Sue is the reason I decided to run the Marine Corps Marathon - she had run it 8 times in the past and told me I absolutely had to run our country's most patriotic marathon. She was right - oh am I glad she talked me into running this race! Sue took my picture with two Marines. When I asked if I could take Sue's picture next, one of the Marines motioned with his gun. "Ma'am, we need to get back to our security detail," he said. Never one to argue with a man with a gun, I nodded and Sue and I headed over to the start. There were flags everywhere; more American flags than I have ever seen in my life. 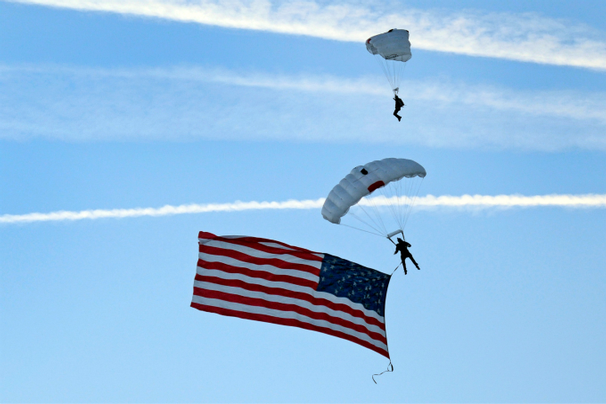 The world’s largest flag to ever fly through the sky during a parachute jump was visible that morning just before the start of the marathon, when US soldiers and sailors brought Old Glory to the ground for us. The countdown began, we all sang "The Star Spangled Banner", the cannon was lit and a large boom was heard. There was a moment of hushed, respectful silence, then we all began running at once. The marathon began. Our running shoes hit the mat. There was no turning back. Thousands of men and women, of all races, nationalities and ages, all wearing a Marine Corps bib with a number proudly displayed, began to run past the Arlington Cemetery towards the sights of Washington, DC. 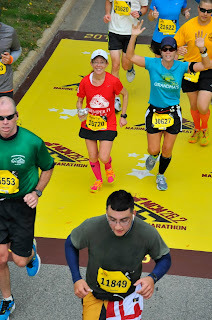 I ran with Ilse, a dentist who lives just down the road from me in Florida and is a member of our running camp. Ilse is a strong, fast runner who I enjoyed training with for the last four months at running camp and on Tropical Trail. In addition to the spectators with the signs, there were Boy Scouts and ROTC students, civilian volunteers and US Marines handing out water for us at tables every 2 miles during the race, and Marines just lining the course, telling us they were proud of us, just keep going. Proud of us? I was proud of them and so grateful for their service. I thanked as many Marines as I could at the finish line and during the mile long walk afterwards. They are the heroes of our country. The scenery is about to get better, I thought at mile 10, as we approached the Lincoln and FDR Memorials. No other place on earth can a runner witness so many American monuments - we also ran by the Jefferson and Martin Luther King Memorials, Korean, WWI and WWII Memorials, the museums of the Smithsonian, and the US Capitol. It is easy to ignore the protestations of weary legs as you see these inspirational sights. There were so many inspirational runners around us. 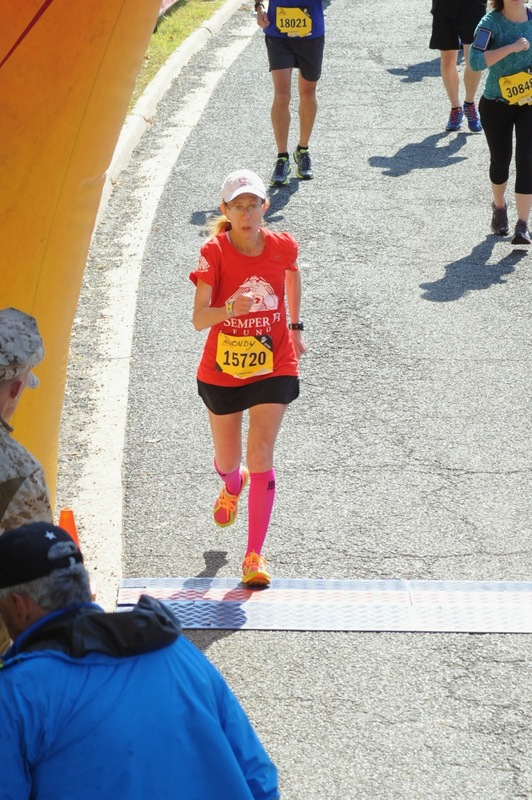 I ran for the charity Semper Fi, which supports wounded warriors and their families. Many of the wounded warriors were there, not only watching the marathon but running it – with burns and scars over most of their bodies, or with hooks instead of legs. Watching these men run – and finish – a marathon makes you realize that anything is possible, any goal is attainable. Ilse and I were silent, then thrilled, when we realized that we were running alongside the Hoyts at one point. We had so much to look at, both in scenery and other runners and all the thousands of spectators and volunteers, that we never felt alone. All the politics I had heard and read back home, angry discussions on both side of the political spectrum, faded into the background. What I saw during this race was a celebration of all things American, and I was proud to be running where all things are possible. The last 2 tenths of a mile were tough, up a steep hill, but it led to the Iwo Jima statue, celebrating the Marine's victory during WWII. As I approached the finish line, I realized that I had reached my goal, a 4 hour 9 minute 15 second marathon, a Boston qualifying time for 2015. I believe – I know – it was by running with Ilse that I was able to qualify for Boston. Thank you Ilse for running with me! 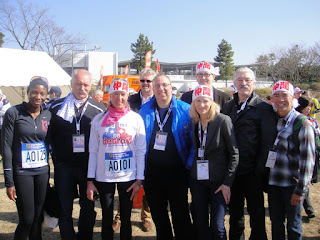 And it was with the support of my husband Larry and my friends, my running coach Doug Butler, the inspirational spectators and runners, and the military and civilian volunteers that allowed me to run a healthy and injury free marathon. After I finished, I made my way to the VIP tent, where I joined Sue and her family. Sue pulled some strings, and got me admitted to the meeting area for the elites, both runners and military members. It was in that tent where I got to meet military dignitaries and take a picture of the winner of the marathon, Ethiopia's Girma Bedada, celebrating with his family. After the marathon it was time to celebrate. About 20 of us from Brevard, and my son Daniel and his friends, joined together at a dinner celebrating not only the marathon but fellow Brevard runner Betsy’s new age group birthday. Wine and cake and free desserts (the service was a bit slow – almost two hours to get the main course - so the manager smoothed things over with free desserts) added to the happy mood in our private room at the restaurant. I want to bring this whole crew to my next marathon, they were all so much fun to wind down with and celebrate after a marathon. For the rest of my life I will remember all it: my friends old and new, so many flags, the service men and women, the volunteers, the runners, the spectators, and the spectacular sights of our nation's capital city. It was when I found myself locked in a public restroom with a toilet I couldn't figure out how to flush that I realized I was in the New Japan. 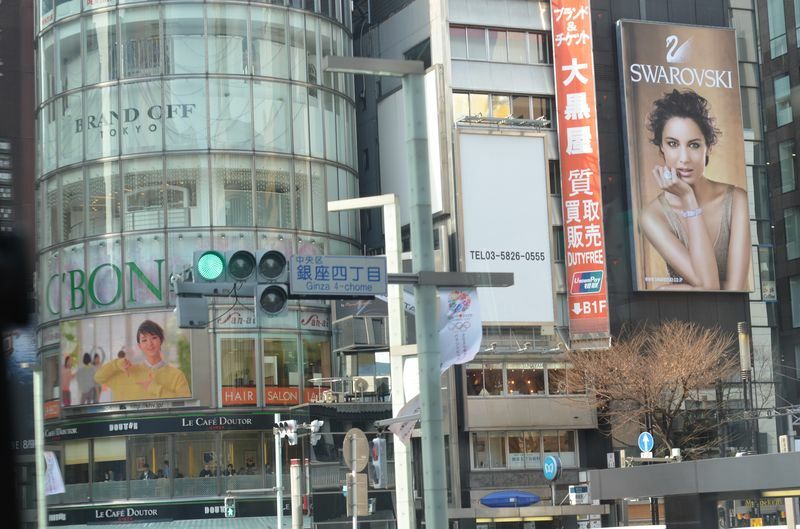 Japan is a country of both ancient history and the latest in technology. 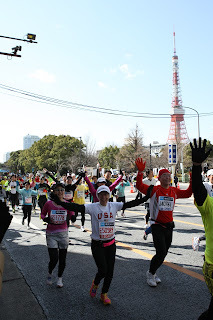 During my visit to Tokyo to run the marathon in February 2013, I discovered I had both my feet (I mean that in the literal sense, you will see why in a minute) in both Japans. In the new Japan, I experienced the technology and city life and a 21st century world class marathon. 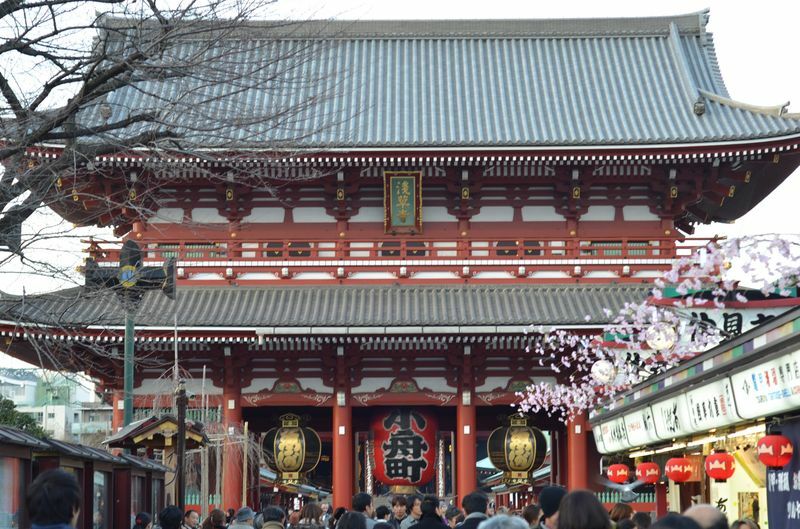 As for the old Japan, while I did get to experience some of the ancient culture, there was something that eluded me throughout my visit. Minutes before I left to fly home, the secret was revealed. 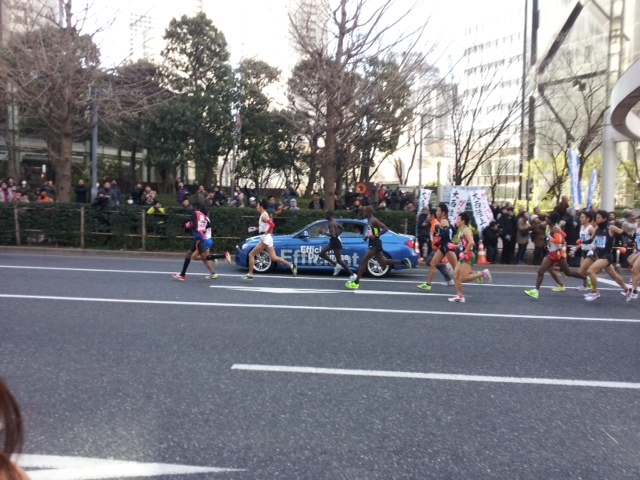 I had my first encounter with the new Japan at the Expo for the Tokyo Marathon. I was in Tokyo to complete the 6th and final of the World Marathon Majors. My friends and I decided to use the restroom (how hard could that be?) before joining checking out the running convention. So I tried to open the door to the stall to see if my friends were still there, but they had left the room, obviously with such superior tech skills that they had not only figured out the toilet/computer but how to open the door to the stall. Which I also couldn't figure out. After some low tech movements involving throwing all my weight into the door handle, I finally flung open the door, and looked at the long line of Japanese women waiting to use my stall. I was embarrassed to just leave, since I didn't flush the toilet, and this is a very polite country and I didn't want to be the Ugly American, so I kind of pantomimed to the woman "how do you flush the toilet?" and tried to bring her into the stall with me. Now, in ANY culture, it is not a good idea to invite a complete stranger into your restroom stall. She opened her eyes wide and started backing up, looking as if she had just seen one of the those monsters in a Japanese movie, but I kept frantically pantomiming the "how do you flush the toilet" thing, and she relaxed, joined me in the stall, and pointed to a black (computer like) screen on the wall, waved her hand next to it, and the toilet flushed. I thanked her and quickly left the scene, thankful that I was a runner and could hightail it out of there. I loooked around for a restroom. Here, there was a long line of outhouses, and just one that had the sign "Western Style" on it. My heart sunk as I realized the sole "Western Style" outhouse was the only one I would recognize, and the hundreds of others, stretching as far as the eye could see, were basically a hole in the floor, where you put your feet on each side. No more description is necessary, but to an American woman wearing running tights only familiar with Western Style, this was Not A Good Option. The Western Style outhouse's door remained closed for what seemed like hours,while the "Asian Style" outhouses had doors wildly swinging open and closed, runners quickly entering and leaving. Precious minutes ticked away while where the woman inside the Western Style door was in there so long I figured she was reading War and Peace on her cell phone. As I later told the other runners from our tour group my story, one of the other women said she, too, used the old style outhouse for the first time. "I couldn't figure out how to stand and, you know, so I just sat down." The rest of us just stared in horror. She looked back at us quizzically, then I could see the awareness of what she had done sink in. "That floor," she said, "oh no..." The rest of us just shook our heads in sympathy. 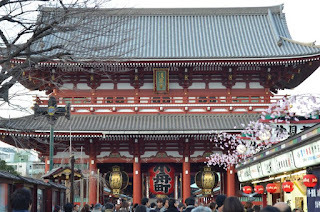 I actually got to see a bit more of Japan than just restrooms with our Marathon Tours and Travel group. And I was lucky to make two close friends. Sheri, my running twin from Michigan, had emailed me before we left home, telling me her friend had sent her an article that appeared in our local Florida Today newspaper about me finishing the World Marathon Majors with Tokyo. "Me too!" she wrote, "I am also a 53 year old woman doing the exact same thing!" Turns out last April we ran London together in 4:18, and we both have a marathon PR of 3:59. Even if I hated this woman I was going to fake like her since we had so much in common, but I instantly liked Sheri. Sheri's roommate Abi, a New Yorker whose parents were born in Nigeria ("why couldn't they have been born in Kenya," she said, "then I would run so much faster!") was an instant friend as well. 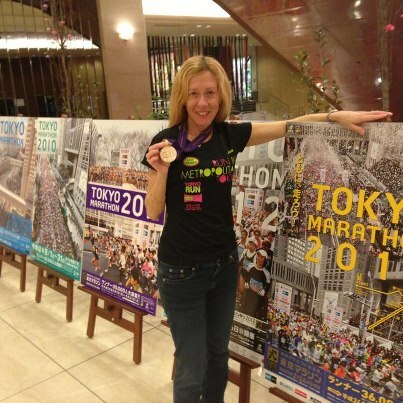 Abi was running Tokyo as her fourth World Marathon Major (in April she will run Boston then London - 6 days apart! - to complete the Majors). Sheri, Abi, and I hung out together the entire time in Tokyo. I was also fortunate to have my niece Lauren fly in from Korea, where she teaches English to schoolkids, to visit me and watch the marathon. 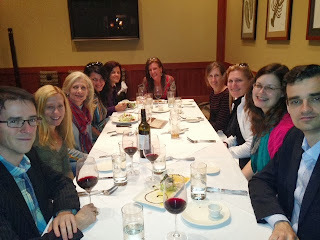 and also had a traditional non Japanese style pasta dinner with our tour group the night before the marathon. As for shopping, I bought everything from old fashioned chopsticks and Samurai headbands to a Hello Kitty purse for my daughter and a Japanese style Mickey Mouse doll. 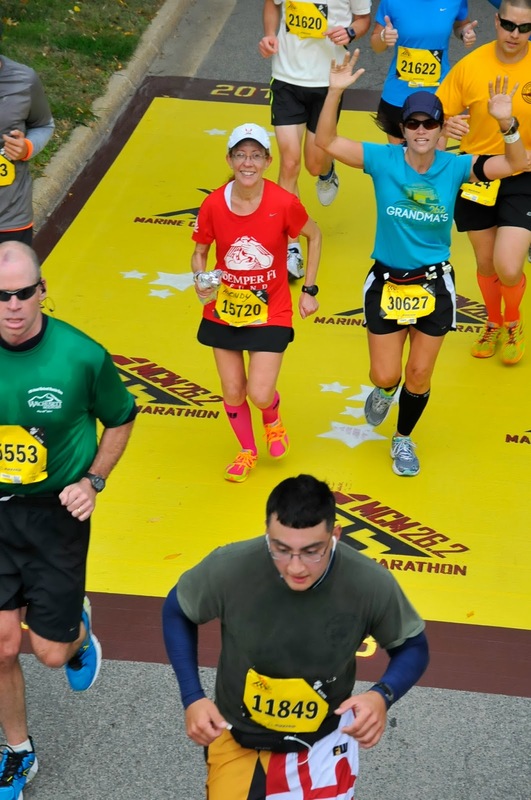 The whole marathon experience was a runner's dream. 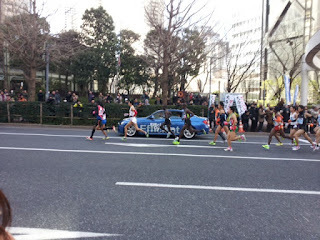 This was the first year the Tokyo Marathon was a World Major, and the organizers did everything to make this flat course, all throughout the city of Tokyo, a first class marathon. As a treat, part of the course was loops, so that when we in the 4 hour corral were running up one loop, the elites, including invited African runners, were running the other side of the street. This was the first time I had ever seen the elites running in a marathon. Just the day before, I had seen them eating breakfast in our hotel, which was the closest I had ever gotten to an elite runner! Truly a Breakfast of Champions! This would be like a regular person (non runner) seeing both Brad Pitt and Angelina Jolie - maybe even some of their kids - eating at their hotel restaurant. And also at the hotel restaurant, I got to meet Gordon, the guy who invented the running chip that we wear on our running shoes, that records our start and finish times. Sheri and spoke to him for about 30 minutes at breakfast, thank you Lauren for putting up with us. And Sheri and Abi got to meet the race directors and representatives from all six of the Majors at the friendship fun the day before the marathon. Again, for runners it doesn't get much better than this. The marathon itself was a blend of the foreign and the familiar. The spectators I saw were all Japanese (except for Lauren, who got some cool pictures!) and were cheering and holding up signs in Japanese. Odd food was handed out throughout the marathon, including traditional foods such as sushi, rice balls, and other food I couldn't identify and was not going to try (adhering to the rule, don't try anything for the first time during a marathon!). And there was the high tech experience. In our corral, when the marathon started, a Japanese man next to proudly showed us his cell phone, which had an antenna on it, and was showing the TV channel which was broadcasting the start of the marathon. We all gathered around him, Japanese and foreigners, and cheered as first the hand cycle athletes, then the elites, took off in front of our corral. As soon as I started running, nothing felt foreign anymore. I was back in my world, running with others towards that finish line at mile 26.2. 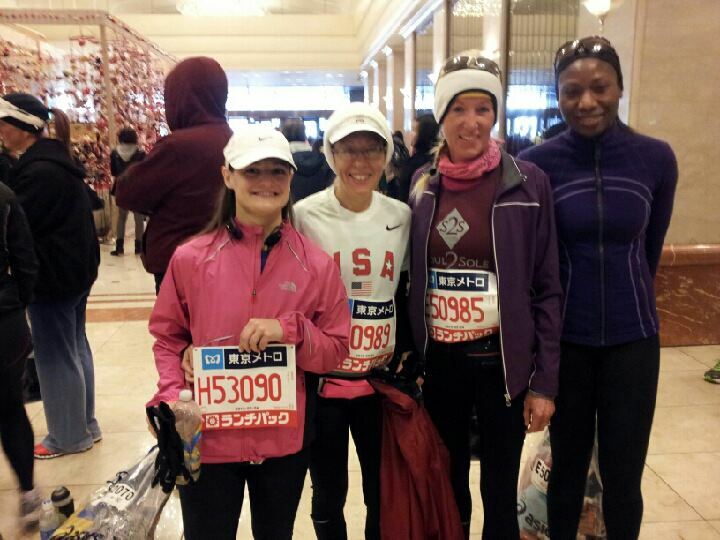 The coolest part for me of the marathon was how the Japanese spectators would cheer for me "USA! USA!" and high five me at the water stops. I was wearing a USA shirt and was so proud to have people on the other side of the world cheer for me and my country. The Japanese people have a very strong work ethic, they work hard - but when they play, they play hard. The costumes I saw at the marathon were funny and inspiring and helped keep me going. There was a huge dragon, with many people underneath, snaking alongside the marathon course. Runners wore costumes as varied as video game and Disney characters, businessman and schoolgirl,(complete with a backpack and a cello case on her back), doctor, Darth Vader, and one guy even dressed as Jesus Christ, wearing only a loin cloth, barefoot, carrying a huge cross, wearing a crown of thorns. This was on a windy day with temperatures in the 40's. We were all humbled by his devotion to his religion. 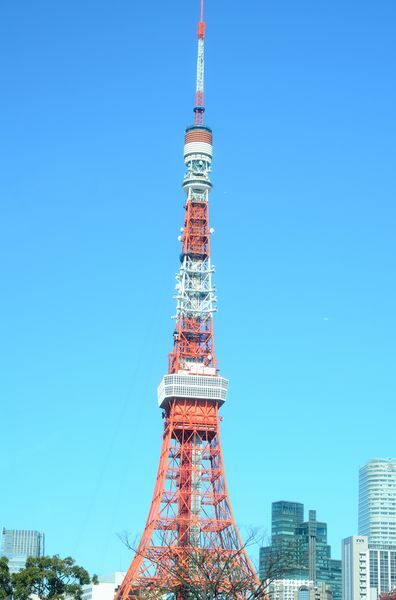 We ran by old Japan, the Imperial Palace, and new Japan, the Tokyo Tower, and just about everything in between. And for a former high school band clarinet player, it was wonderful to run by so many bands, from traditional Japanese drummers to American style jazz bands. 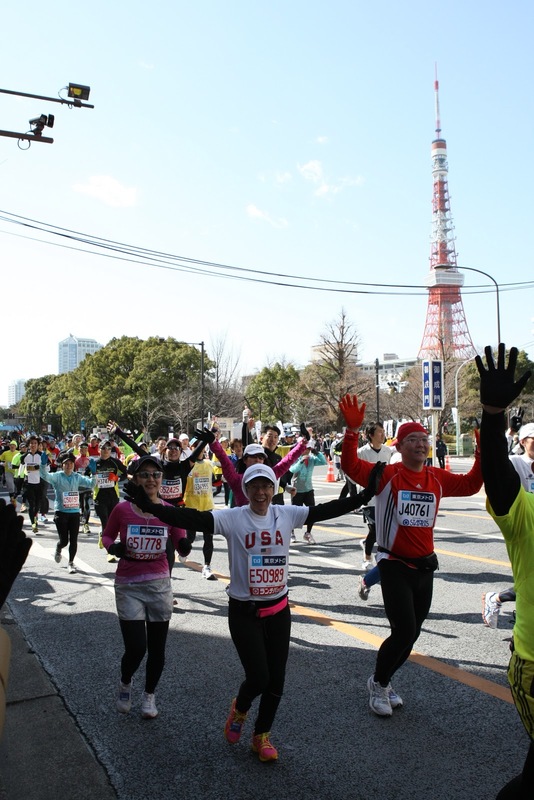 And the recorded music - of course the theme song from the movie "Rocky", and, well, until you've done those hand motions to the Village People's "YMCA" through the streets of Tokyo with runners from all over the world, you have not experienced the fun of the sixth World Marathon Major. Until the last morning, I was a bit disappointed that I didn't get to see Mt. Fuji, since it was always too cloudy. Mt. Fuji is Japan's holy mountain, something almost unobtainable, something that is very difficult to fully experience, a symbol of both old and new Japan. But the morning I was to leave, Sheri and Lauren came into my room, and there, outside the window, was the beautiful snow capped mountain. The old saying goes, "Everyone should climb Mt. 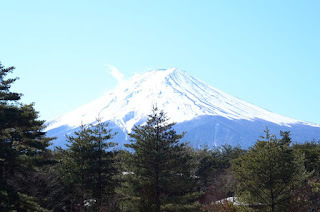 Fuji once, but only a fool climbs it twice." I hope I continue to climb my own mountains, whatever they may be, in my life. And someday perhaps I will come back to old and new Japan again, and be like the everyone in the national saying.